Pull Force Case 1 testing on a B888 magnet. First, let's briefly discuss how we tested for the Pull Force Case 1 values you see on our site. As described in our FAQ, we stick a single magnet to a big, flat, thick steel plate. With a pull force gauge, we measure the force required to pull that magnet directly away from the steel plate. What is a big, flat, thick steel plate? Big means it is at least 2-3 times bigger than the biggest dimension of the magnet. Flat means it has been machined to a very flat surface. Thick means plenty thick enough to ensure that the steel is not saturated -- always at least 1" thick in our test rig. What happens if you stick a magnet on a very thin plate? With a thick plate, the steel is not magnetically saturated. It can "hold" all of the magnetic flux coming from the magnet. If you make the plate thicker, say switching from a 1 inch thick plate to a 2 inch thick plate, it won't make the pull force any stronger. When this is the case, you'll see very little magnetic field on the far side of the steel. If you attach a magnet to a very thin plate, the steel may become magnetically saturated. This means that it can't hold all the the magnet's flux, and you don't get 100% of the pull force you would with a thicker plate. When this is the case, you'll see some of the magnetic field behind the steel, because it isn't thick enough to shield it all. How thin is "too thin?" For a given sized magnet, there's a thickness at which the steel is saturated. For any steel plate of this thickness or greater, you should see 100% of our listed Pull Force Case 1. If you use a steel plate that's thicker, you shouldn't see any real increase in the pull force. When you stick the magnet to sheets that are thinner than this critical number, you will see diminished pull strength. 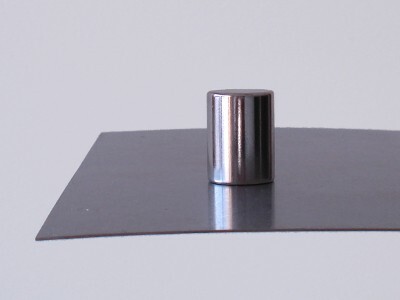 As an example, consider a D84 disc magnet, 1/2" diameter x 1/4" thick. The listed Pull Force Case 1 is 10.88 lb. For this magnet, the Pull Force Case 1 vs. Steel Thickness looks like the graph at right. When you stick this magnet on a steel plate that is at least 0.073" thick, it should pull towards the plate with practically all of our listed 10.88 lb pull force. The calculator displays the steel thickness where you reach 99% of the total possible pull force. This is represented by point A on the graph. If you use a thicker plate, you won't see much increase in your pull force. See point B on the graph. 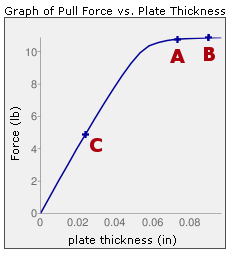 If your plate is thinner than 0.073", you will see a lower pull force. For example, point C represents 24 gauge steel (0.0239" thick), which is the material thickness of a typical refrigerator door. The Plate Thickness Calculator indicates that the pull force is only 4.86 lb, or about 45% of the listed Pull Force Case 1. OK, but what about other magnet sizes? 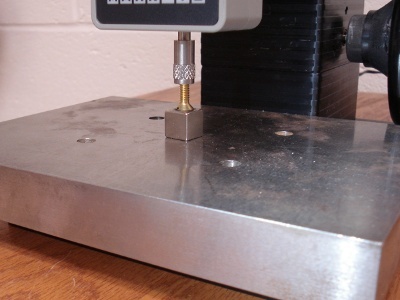 That's where our Steel Plate Thickness Calculator comes in handy. The thickness at which a steel plate is saturated depends on the size and shape of the magnet. We've compiled a huge amount of data from both computer simulations and experimental testing of our magnets with various sheet-metal thicknesses. We've turned this data into yet another great calculator: The Steel Thickness Calculator. It works for any size disc, cylinder, block or ring magnet, stuck to any thickness steel plate. Like the pull forces we list on our product pages, this calculator serves as a great tool to estimate the performance you might expect with a given magnet. It is no substitute for trying out a few magnets in your own application. It is not a guarantee of performance. Other factors including the presence of other magnets, other ferromagnetic structures, or other unforseen differences from our test cases can make your results substantially different. While we hope this is a useful tool, don't try substituting it for good prototyping and careful experimentation. We hope you find this calculator useful. If you have any feedback or questions, please email us at contactus@kjmagnetics.com. We'd love to hear about how you're using this tool, and any comments you might have.